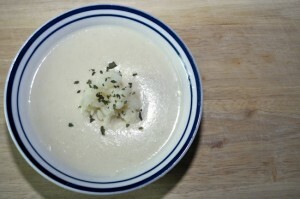 The traditional way to make Cullen Skink is with smoked haddock, onions and mashed potatoes. Lots of people ask me how to make Cullen Skink, but to be honest, it’s just a matter of choosing the options that you prefer yourself. Traditional recipes ask for pre cooked mashed potatoes, but I did not want to end up using another pan, so I put mine in the soup maker way. I like to keep my soup maker recipes easy to follow and to make for my next attempt. I used regular haddock rather than smoked haddock, as I’m not a smoked fish fan. If I’d used the smoked haddock, then I wouldn’t have eaten it. Smoked fish is a very niche taste, with a smaller potential base of people who would enjoy it, so change your ingredients to suit your own tastes. Using the water from the poached fish as the fish stock for your soup is what makes the dish. Without it, the taste will be diluted and it will simply taste of heated milk. In the end, I had a wee bit of a disaster when my soupmaker gave up the ghost half way through and shorted out. It meant I had to transfer it to a pan to finish the job for this recipe, but it still turned out very nice. To serve, I simply dolloped in some mashed potatoes made for the supper that evening, with a dash of parsley on the top. Presentation wise, this is a lovely soup to dish up. It would look perfect on any dinner table with some decoration on top of the actual soup itself. A piece of cooked fish would also work really well sat on top of the mashed potatoes. This is more of a meal in a plate than a regular soup, so be ready to have a full stomach after only one bowl full. This is my version. How would you make yours? Let me know, and add a pic and your own version will go online. Poach the haddock on some water on the stove for around four minutes, until fully cooked. Remove the haddock and strain the fish stock that's left over. Add the potatoes, onion and fish to the soup maker and 200ml of the fish stock. Top up with 600ml semi skimmed milk. Add a teaspoon of salt and pepper. Set your soupmaker to the smooth setting and wait until it's done. You may need to reblend to get the consistency you prefer. Optional. Add up to 100ml of fresh cream and mix well to serve. This soup is not suitable for freezing. I made this recipe today with the odd change to accomodate ingredient availability and to use what I had in my fridge. We can’t get haddock in New Zealand so I used smoked Hake instead and ½ potatoes and ½ cauliflower. I also added some fresh chopped dill and parsley just before serving. It was so delicious, I served it with some grilled garlic bread on the side and I will definitley make it again and again. Thankyou so much for sharing, I just love your website.